Wrecked tanks rust among splintered trees in the Huertgen Forest. painted this picture of the residue of battle in 1945. Below: Major General J. Lawton ("Lightning Joe ") Collins, who wanted to "get on with the attack." He commanded the VII Corps of the 1st Army. 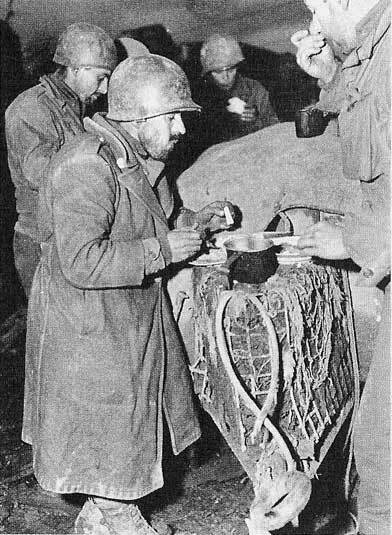 The Battle of the Bulge came to an end in the closing days of January, 1945. The combat divisions were immediately redeployed to resume the offensive into Germany, and the 82nd Airborne, which I commanded, was ordered into the Huertgen Forest, a densely wooded area astride the Siegfried Line, just inside the German border. In the fall of 1944 there had been many grim stories in the Stars and Stripes, the army newspaper, about the fighting in the Huertgen. We were not looking forward to the assignment. I opened the division command post in the midst of the forest in the small town of Rott on February 8, and a few hours later stopped at corps headquarters to get an outline of our next mission. Then, traveling by jeep, I started through the Huertgen Forest to the clearings on the far side where our jump-off positions would be. I learned my first lesson about the Huertgen. It could not be traversed by jeep. The mud was too deep and the jeep bellied down. In addition the forest was heavily fortified and highly organized for defense. Although I had seen heavy pillbox fortifications in Sicily, they were nothing compared with those in the Huertgen Forest. In the Huertgen they were huge (frequently consisting of several rooms). They were dark, and landscaped to blend with the trees—so well covered by leaves and pine needles that they were hardly visible. I was startled when I first realized that I was looking right at one only a short distance away and hadn't realized that it was a pillbox. In, addition to the pillboxes, concertina barbed wire was stretched across the forest floor. This, with trip wires, antipersonnel mines, and antitank mines, reduced the fighting to its most primitive form: man against man at grenade distance. Having been preoccupied with the Battle of the Bulge, the Allies had paid little attention to the Huertgen Forest for the past several months. I found a road that a jeep could travel on, and went to the town of Vossenack on reconnaissance without meeting any enemy. The Germans presumably had withdrawn to the Roer River or very close to it. I left my jeep in the town and started down the trail that crossed the Kall River valley. I was accompanied by the Division G-3, Colonel John Norton, and Sergeant Walker Woods. It really was a reconnaissance, since I did not know what the lay of the land would be, and what, if any, enemy might still be there. Our orders for the following day were to attack across the Kall River valley from Vossenack and seize the town of Schmidt. By now most of the snow had melted and only small patches remained under the trees. I walked down the trail, which was obviously impassable for a jeep. It was a shambles of wrecked vehicles and abandoned tanks. The first tanks that had attempted to go down the trail evidently had slid off and thrown their tracks. In some cases tanks had been pushed off the trail and toppled down the gorge among the trees. Between where the trail began outside of Vossenack and the bottom of the canyon there were four abandoned tank destroyers and five disabled and abandoned tanks. In addition, all along the sides of the trail there were many, many cadavers that had j ust emerged from the winter snow. Their gangrenous, broken, and torn bodies were rigid and grotesque, some of them with arms skyward, seemingly in supplication. 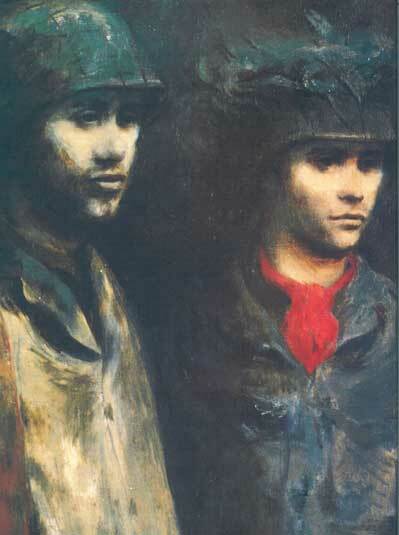 They were wearing the red keystone of the 28th Infantry Division, the "Bloody Bucket." It evidently had fought through there in the preceding fall, just before the heavy snows. Below: Men of Company E, 110th Regiment of the 28th Infantry Division, cautiously push ahead near Vossenack on November 2, 1944. I continued down the trail for about a half a mile to the bottom, where there was a tumbling mountain stream about six feet wide. A stone bridge that once had crossed it had long since been demolished, and a few planks were placed across the stone arches for the use of individual infantrymen. Nearby were dozens more dead men. Apparently an aid station had been established near the creek and in the midst of the fighting it had been abandoned, many of the men dying on their stretchers. About fifty yards off to the right, a hard road appeared. Across it were six American antitank mines. On the near side of the mines were three or four American soldiers who apparently had been laying the mines and protecting them when they were killed. Beyond the American mines, about ten feet away, were some German Teller mines, connected like beads on a string. And on the other side of these were three or four German dead, a dramatic example of what the fighting must have been like in the Huertgen. It was savage, bitter, and at close quarters. I made my way up the far side of the canyon. One had to be extremely careful because the trail had not been cleared of mines. I assumed that the woods were infested with them and hence did not even get near the edge of the trail. The great forest in which so many Americans died. As we approached the top, all the debris evinced a bitter struggle. There were more bodies, an antitank gun or two, destroyed jeeps, and abandoned weapons. We emerged from the top of the trail into a wide clearing. A few miles away we could see the small German town of Kommerscheidt. So far, we had not been challenged by any Germans, but I knew they were supposed to be in Kommerscheidt and in the town of Schmidt, beyond. The sun was setting and I was anxious to get back to the other side of the valley before darkness. As evening descended over the canyon, it was an eerie scene, like something from a low level of Dante's Inferno. To add to the horror, a plaintive human voice could be heard calling from the woods quite some distance away. We continued on down and up on the other side, reaching Vossenack in the darkness. During the night, troops were moved up to the town, and I went back down the trail with the leading battalion not long after daylight. I remember vividly the battalion stopping for a short break. A young soldier, a new replacement, was looking with horror at the dead. He began to turn pale, then green, and he was obviously about to vomit. I knew his state of mind: every young soldier, upon first entering combat, is horrified by the sight of bodies that have been abandoned. They always imagine themselves dead and neglected. I talked to him, calmed him a bit, and assured him that our outfit never abandoned its dead, that we always cared for and buried them. Soon the battalion continued down the trail and up on the other side. It attacked across the open land, seized Kommerscheidt and then Schmidt. The fighting was moderate to heavy, and after capturing Schmidt we continued to receive artillery fire. It seemed obvious to me that the regiment could not be supplied across the Kall River canyon, certainly not if the enemy interfered or if artillery fire covered the trail. In addition, the trail was impassable for vehicles. A catastrophe must have occurred there in the fall of 1944. I could not understand why the bodies had not been removed and buried. Neither the corps nor the army headquarters could have been aware of the conditions in the canyon. Otherwise the corpses would have been interred and the disabled tanks recovered. As soon as I returned to the command post, I called the chief of staff of V Corps and explained the situation to him, emphasizing the need for an alternate supply route. There was a good one from Lammersdorf to Schmidt and that was under V Corps. He listened to my story, then laughed and asked, "Have you tried pack mules?" It made me furious. There is nothing that angers a combat soldier more than a higher headquarters staff officer belittling the problems of the combat infantryman. It is as old as soldiering. as they shelter behind a blasted building. 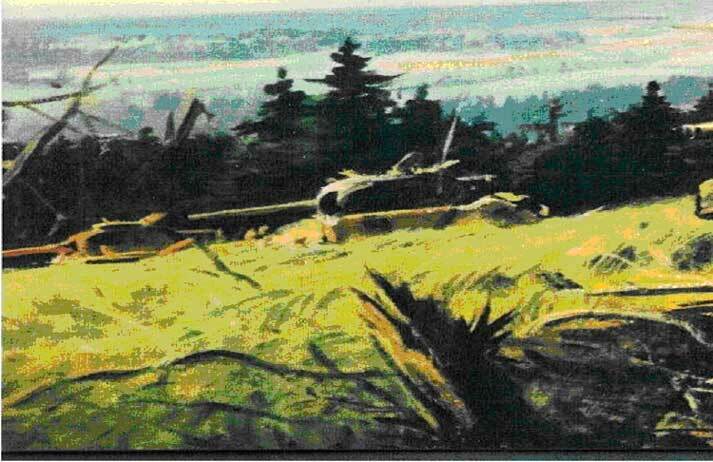 Lt. Bernard Arnest of the 28th Infantry painted this water color. The following morning I went to Lammersdorf to meet the commander of V Corps and the commander of the division whose headquarters was in that town. Obviously, the attack on Schmidt should have been made straight down the ridge from Lammersdorf. Lammersdorf and Schmidt are connected by a paved road, the terrain was a mixture of woods and open farm land—good tank country—and it would have been a much simpler tactical undertaking than crossing the Kall River. The question in my mind was how in the world did they ever get involved in attacking across the Kall River valley in the first place? Why not stick to the high ground, bypassing the Germans in the valley, and then go on to the Roer River? I raised this question with a corps staff officer present, but he brushed it aside. Apparently that was a "no-no" question, not to be talked about. In the meantime I noticed that the corps commander and the commander of a new division were bent over a map. The corps commander occasionally drew a short line with a blue grease pencil. The line represented an infantry battalion, and he was suggesting to the division commander a tactical scheme by moving battalions about. I realized how remote they were from the reality of what it was like up where the battalions were. The thought crossed my mind that the disaster that had befallen the 28th Division may have been related to the lack of understanding in higher headquarters of what the actual situation in the Kall River valley was. That turned out to be true. Optimism was widespread in the Allied high command in Europe in the late summer of '44. As the summer waned, the world was treated to the spectacle of the German 7th Army and the 5th Panzer Army fleeing from the battlefields of Normandy. Handcarts, horses and wagons, bicycles, baby carriages, anything that they could lay their hands on were used to help in their escape. Eisenhower's staff seemed convinced that the war was over. His chief of staff, Lieutenant General Bedell Smith, announced to the press in early September, "Militarily the war is over." Most astounding, post exchange officers sent orders back to the States to stop all Christmas packages. The war would be over by Christmas. And the optimism went beyond the generals. Meeting with President Roosevelt at Quebec on September 10,1944, Winston Churchill remarked, "Victory is everywhere." And later he added, "I would not be surprised, now that the American 3rd Army is standing on the border of Germany, if the enemy surrendered within weeks." But the very success of Eisenhower's armies contained the seeds of trouble. By September he had outrun his supplies. Trucks bringing gasoline and ammunition to George Patton's army, for example, had to travel 360 miles back to the Normandy beaches. And by the end of August, 90 to 95 per cent of the supplies for Eisenhower's armies lay in depots near the beaches. The northernmost of the U.S. armies was the 1st U.S. Army, commanded by Lieutenant General Courtney Hodges. I had known General Hodges when he was Chief of Staff of the Philippine Division from 1936 to 1938. He was an intelligent, thoughtful, studious sort of officer. Unlike the other U.S. Army commanders, he was not a West Pointer. He attended the military academy but dropped out during his plebe year, enlisted, and earned his commission from the ranks. He was a veteran of World War I and knew his trade well; some thought him rather colorless—certainly he was when compared with Patton—but those who knew him had great respect for the consideration he showed for his troops; he was always careful not to waste his men and was cautious in his tactical deployments. The 1st U.S. Army was a veteran command. It had made the Normandy assault and promptly accomplished its first mission, capturing Cherbourg. Thereafter, it endured very heavy fighting in the Normandy hedgerows for almost two months. In July, Patton's 3rd Army came ashore and was committed to battle on the right of the 1st. It rampaged through Brittany and directly contributed to the defeat and rout of the Germans in mid-August. Both the 1st and 3rd armies pursued the enemy vigorously, and by mid-September they were up to the German frontier. The U.S. 1st Army was still in pursuit, with all three of its corps in line across a front of more than 120 miles—far too widespread to engage in heavy combat—as they considered themselves to be still in pursuit of a beaten enemy. Furthermore, during the long trek across France, maintenance of vehicles, especially tanks, had been badly neglected. For example, the 3rd Armored Division had only 75 serviceable tanks out of an allotment of 232. Then, too, some combat divisions had dropped their artillery far behind in order to use the artillery tow trucks to carry infantry. As they neared the German frontier, there was much speculation about the Siegfried Line. Rumor had it that the pillboxes and fortifications were unmanned. But General Hodges anticipated heavy fighting and he thought it best to delay his advance for about two days to permit his forces to regroup. The corps commanders were impatient, however, particularly Major General Joe Collins, commander of the VII Corps; they wanted to get on with the attack while they had momentum and before the Siegfried Line could be manned. Collins reasoned that if he penetrated the line, so much to the good, but if unexpected resistance occurred, he still would not have lost anything. However, the Germans were far from defeated. Indeed, they were preparing a major counteroffensive. 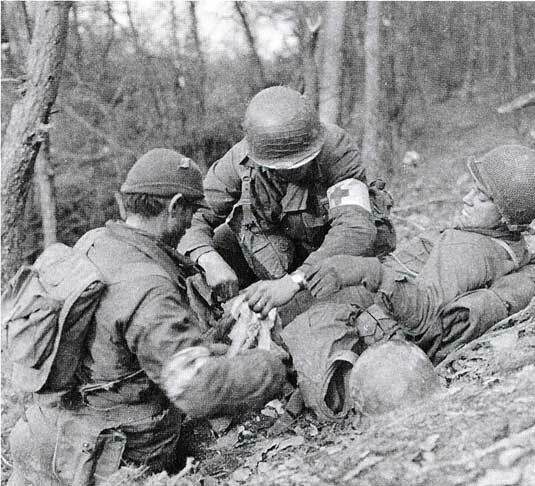 By an odd coincidence, an army photographer working in the Huertgen Forest on November 18, 1944, first snapped Private Benny Barrow of the 4th Infantry Division helping a comrade up a steep bank (left), and later came across Barrow, now wounded, being treated by medics. At right, another casualty is carried back to an aide station. On September 5, 1944, Hitler called back Field Marshal Gerd von Rundstedt. He had dismissed him earlier, in July, after von Rundstedt, upon being queried by the German high command on what they should do, replied, "End the war, you fools." Now he was forgiven in the hour of need. He was respected throughout the German army and was the one soldier who could rally the Wehrmacht. His problems were many, but he went about solving them in a very businesslike manner. To begin with, he managed to bring General Gustav von Zangen's 15th Army from Calais by barge and boat to positions in Holland to confront the Allies. Systematically, efforts were made to round up and reassign individuals and small groups of German soldiers that had made their way back from the battlefields of France. Fortunately for von Rundstedt, the high-command structure down to and including some of the combat divisions was generally intact. While von Rundstedt was assembling troops, Hitler took additional steps to bolster the defenses. About a hundred "fortress" infantry battalions were hastily re-equipped and hurried to the front. These had been used in rear areas and they were made up mostly of undertrained and overage individuals. They were to give a good account of themselves in manning the Siegfried Line. While these moves were under way, Hitler made one of his intuitive decisions. On Saturday, September 16,1944, he had a conference in his East Prussian headquarters, the Wolf's Lair. Field Marshal Jodl was ticking off the depressing statistics: shortages of ammunition, shortages of tanks, German troops withdrawing from southern France. Suddenly, Hitler interrupted, "I have just made a momentous decision. I shall go over to the counterattack, that is to say," pointing to the map unrolled on the desk before him, "here, out of the Ardennes, with the objective—Antwerp." The counterattack was scheduled for a launching within two months, although, as it finally developed, it took three months. To deny the Allies the type of information that they had obtained by radio intercept in the past, Hitler insisted that all communications would be by wire, written messages, or staff visits. There would be no radio communications among the higher formations. Thus he undertook to organize a counteroffensive that would involve three field armies, consisting of twenty-one divisions, including eight Panzer divisions. Opposing the U.S. 1st Army was the German 7th Army commanded by General der Panzertruppen Eric Brandenberger. His mission, once Hitler's decision had been made, was to hold off the U.S. 1st Army until the counteroffensive could be launched. At this point another factor entered into the German thinking. Behind the Siegfried Line, in the Huertgen Forest area, were a series of major dams that controlled the flow of water into the Roer River. By opening these dams, General Brandenberger could effectively block the U.S. 1st Army from crossing the Roer and thus making its way to the Rhine at Cologne. So, Brandenberger's mission was to protect the dams, using the Siegfried Line and all the odd-lot troop formations that he could find, as well as one or two battle-experienced formations. And finally, the German positions were to be held at all costs to permit the build-up of a great counteroffensive, which Hitler was convinced would split the Allies and bring about a petition for peace. Thus the stage was set for the battle of the Huertgen Forest. "The Huertgen," the GI's called it. To the soldiers the word "Huertgen" was synonymous with getting hurf. It was to be known as one of the most costly battles in our history. Yet, when the fighting in the Huertgen Forest began, no one, neither American nor German, had a clear idea of how intense and costly it would be. The Americans wanted to seize the eastern edge of the forest and in so doing protect the right flank of the U.S. 1st Army, which was moving on to Cologne. But neither side could guess the other's objective and both sides were surprised by the intensity and heavy cost of the fighting that followed. 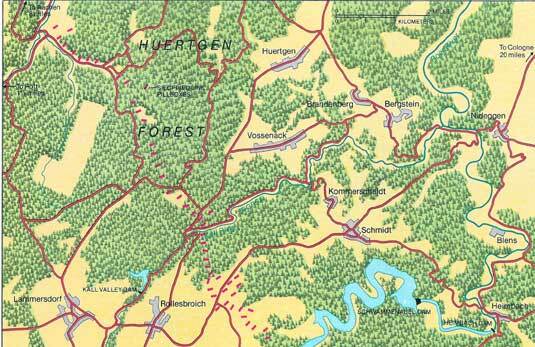 The Huertgen Forest is part of a heavily wooded area of about fifty square miles. It begins about five miles southeast of the city of Aachen. As the official U.S. Army History described it: "Looking east from the little German border villages southeast of Aachen, the Huertgen forest is a seemingly impenetrable mass, a vast undulating blackish-green ocean stretching as far as the eye can see. Upon entering the forest, you want to drop things behind to mark your path, as Hansel and Gretel did with their bread crumbs." After traversing the forest for three or four miles, one came upon open farming country on higher ground. Two ridges thrust like fingers toward the distant Roer River. On the north, extending to the northeast for three miles, was the ridge containing the towns of Huertgen, Kleinhau, and Grosshau. To the south was a longer ridge, extending from the town of Lammersdorf toward Schmidt, the town which overlooked the principal dam on the Roer River. Between these cleared ridge lines lay the deep Kall River gorge. The famed Siegfried Line, or West Wall, consisted of two lines of fortifications, running parallel and several miles apart, directly through the Huertgen Forest. Each line had to be taken in turn, and each contained a large number of pillboxes with interlocking fields of fire, bunkers, and command posts. As General Hodges prepared plans for his move across the Roer River and on to Cologne on the Rhine, he looked with some concern at the Huertgen Forest. General Hodges and General Collins were both veterans of World War I. They recalled the heavy fighting in the Argonne Forest, and they knew that the Huertgen could provide cover for a German force that might seriously threaten their right flank. So far, they had not given any thought to the dams. They believed, however, that their present widespread deployments could sweep through the forest without too much delay, and in so doing seize the high ground overlooking the Roer. The veteran 9th Division was chosen for the task. Its 38th Infantry Regiment was given the principal mission. It crossed the German border and entered the village of Lammersdorf on September 14. It was protected by the 47th Infantry Regiment, which was about seven miles to the north, and the 60th Infantry Regiment, also of the 9th Division, about five miles to the south. This deployment of the three regiments was far too widespread to break through serious resistance. The 39th learned quickly that the Germans were manning the pillboxes of the Siegfried Line. It was the toughest defense situation that they had encountered since Normandy. After three days of costly, bitter fighting, they had advanced only about a mile and a half. The Germans continued gradually to build up their defenses, and the battle raged back and forth through the pillbox area. It was a special kind of warfare for which our troops were not well trained or equipped. As it turned out, the 9th Division was the first of a steady procession of American units which in subsequent weeks would learn to equate the Huertgen with gloom, misery, wounds, and death. General Collins decided to stop the attack and to regroup his forces. The forest remained unconquered. Major Freeman knew that a hot meal such as this one was just what his man didn't need on Thanksgiving. Any slight activity brought down a rain of mortars and artillery, and I'm sure you know the devastating effects of tree bursts. I was in the foreward C.P. [command post] when I was informed the cooks would bring up cannisters of a hot turkey dinner and serve it to the men in the lines. I called the Bn. commander and told him that in our present position this would be murder—plain and simple—that as soon as the men got around the cannisters Jerry would turn all hell loose. I was told this was a Regimental order and I got permission to talk to the Regimental commander. Hindsight says I could have stalled off the dinner and I doubt that the higher echelons would have known about it— but I didn't. I was told this was a Division order and somehow or other talked him into letting me talk to the Division commander.
. . . I was S-3, 2nd. En. 121 Inf., 8th. Div., and my outfit was the only one to secure the village of Huertgen, and hold on to it. Your remark that the generals had no idea of what the men were up against really hit home. It started out with all the making of a debacle. Someone seemed to think this was a Ft. Benning exercise, instead of a penetration of a thickly mined, well fortified, dense forest where you were lucky if you could see twenty feet. Our introduction to this hell hole was to be dumped off our trucks, and before the advance party could do a thing we were to make a "passage of lines" through the holding troops and continue on to attack. It was a mess that took days to straighten out! To emphasize your point about not knowing what the men were up against I would like to cite one incident that still haunts me. On Thanksgiving day we were not in Huertgen, but still strung out in the dense forest outside the town. I tried to explain the conditions, and requested a delay of a day or two until we could get out of this position, but was told in no uncertain terms that the men would be fed today! Granted that greater control could have been used all down the line... but dangle hot turkey to men in a cold, wet forest, that have had nothing but K rations, and it's not that easy to keep them from bunching. Jerry turned all hell loose! Branded in my mind is position after position with men torn to shreds around busted up turkey cannisters—as many as ten in one place. For many, many years after the war I would go to one of my relations for Thanksgiving dinner, and before I could touch a bite I would get up and go to the back yard and cry like a baby. I passed up a helluva lot of turkey dinners. Early in October the decision was made to attack once again, using the same 9th Infantry Division. At last, the higher staff were beginning to attach some importance to the dams. Some prisoners told them of the German plans for the dams and that arrangements had been made to ring church bells in the villages downstream when the flooding began. The 9th Infantry Division launched its attack on October 6 with Schmidt, which overlooked the Schwammenauel Dam, as its objective. Again the German resistance stiffened. The Infantry found themselves widely dispersed, and their losses were appalling. Vehicles and tanks bogged down in the forest. The dense tree cover denied them support from their own air force. German artillery projectiles burst in the tops of the trees, hurling shell fragments earthward. Replacements were lost by the hundreds before they could even join their outfits. When they did arrive, they found that the problem of the tree bursts made it necessary for them to cover their foxholes with logs. When caught in the open, the soldiers learned that the safest defense was to stand or to crouch rather than to lie flat on the forest floor. By late October the Huertgen had taken its toll. The 9th Division had gained no more than three thousand yards, which they paid for in one and a half casualties per yard. The division had lost about forty-five hundred men, and according to the official report, "The real winner appeared to be the vast, undulating, blackish-green sea that virtually negated American superiority in air, artillery, and armor to reduce warfare to its lowest common denominator." The forest refused to yield, and now there were the dams. painted by Lieutenant Arnest near Vossenack in October, 1944. 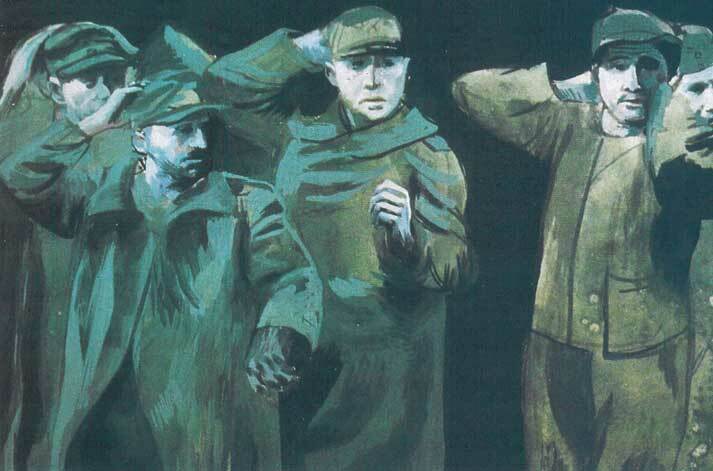 The next month, Arnest painted the group of tense German prisoners below. Toward the end of October General Hodges set the date of November 5 for the main attack that would take his 1st Army across the Roer and on to the Rhine. The principal effort was to be given to Joe Collins' VII Corps. His mission was to clear the Huertgen Forest and seize the high ground to the east. The dams were transferred to General Gerow's V Corps on Collins' right. 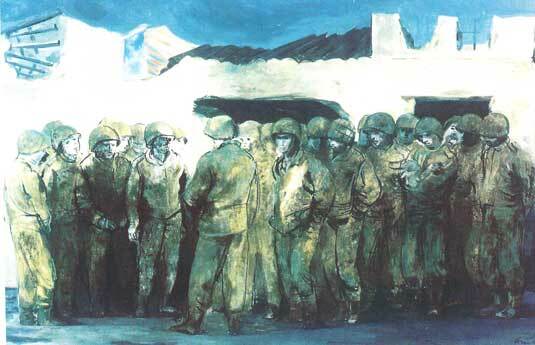 Hodges was anxious that the V Corps get started as soon as possible and he set the date of November first. Its mission was to clear the Vossenack-Schmidt-Lammersdorf triangle down to the headwaters of the Roer River, so as to protect the right flank of the 1st Army. To increase the V Corps' strength, it was given the 28th Division and a combat command of the 5th Armored Division. The 28th was the Pennsylvania National Guard Division. It had made the Normandy assault and was fresh and experienced in every respect and ready for its difficult mission. By now, the Huertgen was recognized as a tough nut to crack. Considerable pressure was put on the 28th Division commander, Major General Norman D. Cota. His principal mission was to seize Vossenack, cross the Kall River gorge, seize Kommerscheidt, and then Schmidt, enabling the V Corps to command a position close to and overlooking the Schwammenauel Dam. The 112th Infantry Regiment (of the 28th Division), commanded by Lieutenant Colonel Carl L. Peterson, was assigned the central position. It was supported on its left by the 109th Infantry, which moved toward the village of Huertgen, and on the right by the 110th Infantry, which moved to the south in the direction of the village of Raffelsbrand. It should be noted that the three regiments diverged from the beginning and, in fact, uncovered the flanks of the middle regiment, the 112th Infantry, which had a difficult mission at best and one that could have been catastrophic if its flanks were attacked in the Kail River gorge. The division was opposed by the German 275th Division, which had proved its mettle against the 9th Division earlier. By this time heavy autumn rains and dense fogs and mist plagued the attackers. Soon there would be snow. The infantry could expect little air support. The attack on Schmidt was launched on November second in characteristically bad weather. Despite poor conditions, however, both V Corps and VII Corps supported the forthcoming attack with artillery barrages. By H-hour the 28th Division artillery had fired 7,313 rounds. The high command had at last learned respect for the German defenses and they were taking no chances. 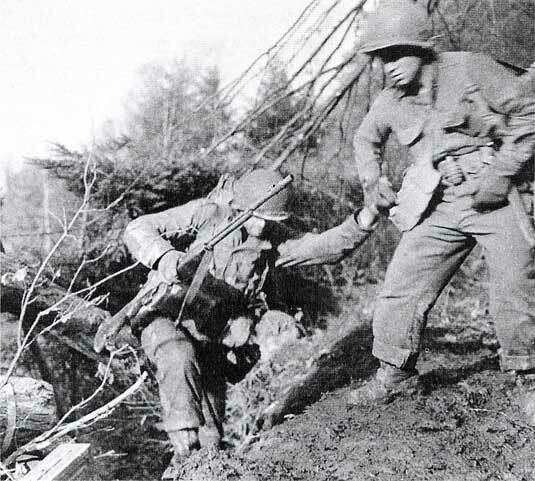 The attack went off on schedule and the second battalion of the 112th Infantry captured Vossenack by early afternoon and soon were digging foxholes on the forward slopes overlooking the forested valleys below. The two remaining battalions of the 112th Infantry moved through Vossenack down the trail across the Kall River gorge, virtually unopposed, until they were all the way across the Kall and crossing the open farm country in sight of Kommerscheidt. Kommerscheidt and Schmidt, in turn, were seized with little opposition. There was elation in the 28th Division Headquarters, and the division commander, General Cota, was to say later that he felt like "a little Napoleon." But the elation was short-lived. Actually, the Germans were in the process of replacing the forces that had been defending Schmidt. The following day the Germans counterattacked with armor and drove the defenders from their water-filled, icy foxholes around Schmidt back on Kommerscheidt, and later pushed the survivors of Kommerscheidt to the edge of the Kall River gorge. In addition, they attacked all along the gorge, thus cutting off the remnants of the two attacking battalions that had just been driven from Schmidt and Kommerscheidt. Repeated orders by the 28th Division to recapture Schmidt were meaningless, as the survivors were incapable of mounting an attack. The regimental commander was directed to report to division headquarters. Although he was physically exhausted and twice had been wounded by artillery fire, he started down the trail of the Kail River gorge. He was in bad physical shape when the engineers on the trail found him, put him in a jeep, and started him back. He must have been a sight to see when he walked in on General Cota. At the sight of him, Cota fainted. Before the engagement was through, the 28th Division suffered over six thousand casualties. The 28th was followed in turn by the 4th, the 8th, and the 83rd infantry divisions, and a combat command of the 5th Armored Division. Tragically, before it was over, not only were the casualties frightful, but the real objective turned out to be not the Huertgen Forest itself but the dams over the Roer River on the far side of it. Over twenty-four thousand Americans were killed, missing and captured, or wounded in the fighting in the Huertgen and another nine thousand succumbed to the wet and cold with trench foot and respiratory diseases, for a total cost of thirty-three thousand men. In retrospect it was a battle that should not have been fought. Once we were in it, the higher command did not seem to appreciate the incredible conditions under which the infantrymen had to fight. Unlike other battles in Europe up to that time, we sacrificed our ground mobility and our tactical air support, and we chose to fight the Germans under conditions entirely to their own advantage, in which they fought from strong fortifications on ground they knew very well. In an interview after the war, General Major Rudolph Gersdorff, chief of staff of the German 7th Army, said, "The German Command could not understand the reason for the strong American attacks in the Huertgen forest... the fighting in the wooded area denied the American troops the advantages offered them by their air and armored forces, the superiority of which had been decisive in all the battles waged before, etc." But the Huertgen was over and I think it fair to say that little was learned from it and less understood. From October until mid-December the Germans had fought hard to protect the assembly of the armies that Hitler had earmarked for his great counteroffensive—the Battle of the Bulge. The Germans had fought with skill and courage and took heavy casualties. The Allies had no idea of the coming counteroffensive, so one must judge the German defense as having been entirely successful. On December 16, 1944, Hitler launched three field armies against the Allied center, on a seventy-mile front. At once the Huertgen lost its importance as all attention was focused on the Ardennes. 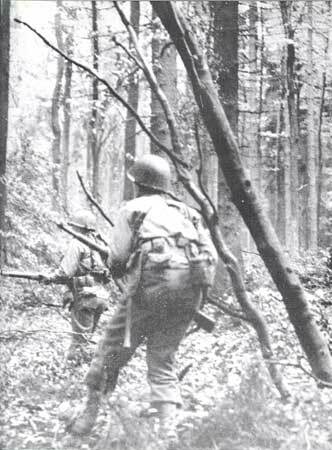 Military critics have argued about the battle of the Huertgen Forest ever since World War II. Today, at the Command and General Staff College at Fort Leavenworth, Kansas, it is presented by the faculty to each new incoming class as a case history. Particular emphasis is placed upon the attack of the 28th Infantry Division across the Kall River gorge, and on to Kommerscheidt and Schmidt. They point out the disastrous consequences that can befall a command when the generals do not know the environment in which the troops must fight. A troublesome aspect of the Huertgen battle is that it was fought by experienced, courageous battle leaders who made few other mistakes during the war in Europe. So why did it happen? In the first place there was the optimism that was so pervasive throughout all echelons of the Allied forces in the late summer of 1944. It seemed clear that the Germans were beaten, badly beaten. Then there was the unbelievably poor intelligence of the Allied high command. Up to the fall of 1944 the Allies depended heavily upon ULTRA SECRET, that priceless information that came to them from radio intercepts of German communications to and from tactical headquarters. When the intercepts were suddenly brought to a stop by Hitler's ban on all radio communications, no one seems to have questioned what was going on. Hitler therefore was able to assemble twenty-one combat divisions, including eight Panzers, without the Allies knowing anything about it. In retrospect, this seems unbelievable, but all three events were closely related—the unbridled optimism of the high command, the discontinuance of the radio traffic of the German formations, and their ability to organize a major counteroffensive. Thus, to the Germans, the battle of the Huertgen Forest was Phase One of the Battle of the Bulge. That battle was Hitler's last gamble. 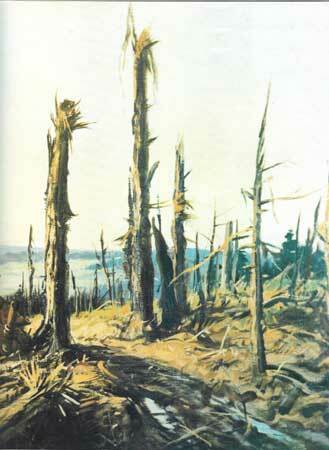 The bitter, costly fighting by the Germans in the Huertgen Forest in October and November of 1944 was essential to their chance of success. But for us, Huertgen was one of the most costly, most unproductive, and most ill-advised battles that our army has ever fought. (*) General Gavin commanded the famous 82nd Airborne Division during World War II.